I hve Maggie n leader position but I didn't receive leadership reward. Is this known glitch? @Carly , unlike Glenn, her extra xp isn't separately calculated. It's working based on what I see in the screenshot. 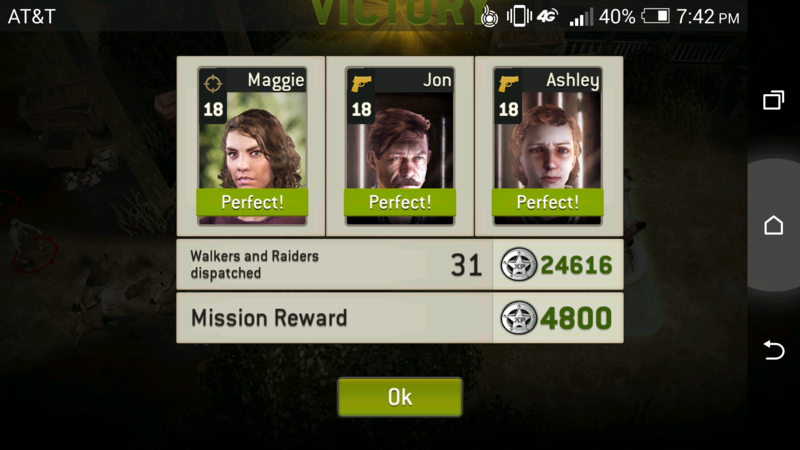 Take a look at xp that pops up during kills with and without Maggie. I did the same thing, but images won't post for some reason. With Maggie as the leader, zombies' kill reward was higher than the same kill with Darrel as leader. Maggie's bonus is calculated as you play, unlike Glen's, which is added at the end. @zbot Why is not displayed separately? I'm probably not the only who prefers the leader trait bonus to be shown just like in the case of Glenn. It's more consistent. This the most recent thread I could find that has some comments from @Shteevie on your question. @Mabiki thank you for finding that post! @PnutButtrSandwich sorry I didn't see the tag, my thinking for Glenn it's a separate since you don't collect supplies in missions, while xp is earned based on kills. But when we have 2x supplies event the supplies from chests are already doubled not like when you are on 2x xp booster where it shows the original amount then doubles it. There's inconsistencies that can be confusing.